Some time ago, I read this great topic on a Dutch¬watch forum called dezinvanluxe.nl,¬it is about Steef¬who likes to collect catalogues of watch brands. 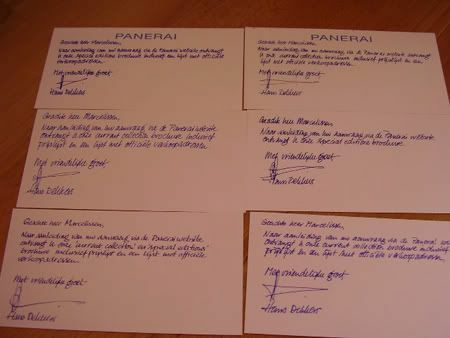 When you¬live in The Netherlands and ask for a Panerai brochure¬via Panerai.com, you will receive one with a handwritten ‘compliments’ card.¬Steef probably ordered a few catalogues to much, because he got an email from Hans Dekkers, brand manager¬for Panerai BeNeLux and Scandinavia. Hans Dekkers¬wrote to Steef that he shouldn’t¬expect to get hand written¬’compliment’ cards anymore, after posting the picture above¬with¬6 hand written¬cards at the mentioned forum.